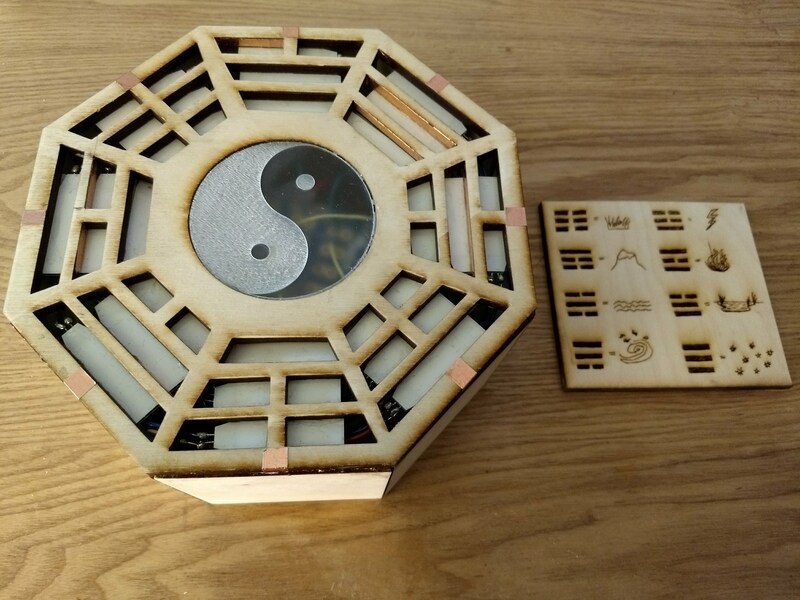 An octagonal wooden box displays eight I Ching trigrams. To request a reading a person chooses a trigram by touching the corresponding copper square. This makes it and another trigram light up, as the box gauges the environment at time of contact. 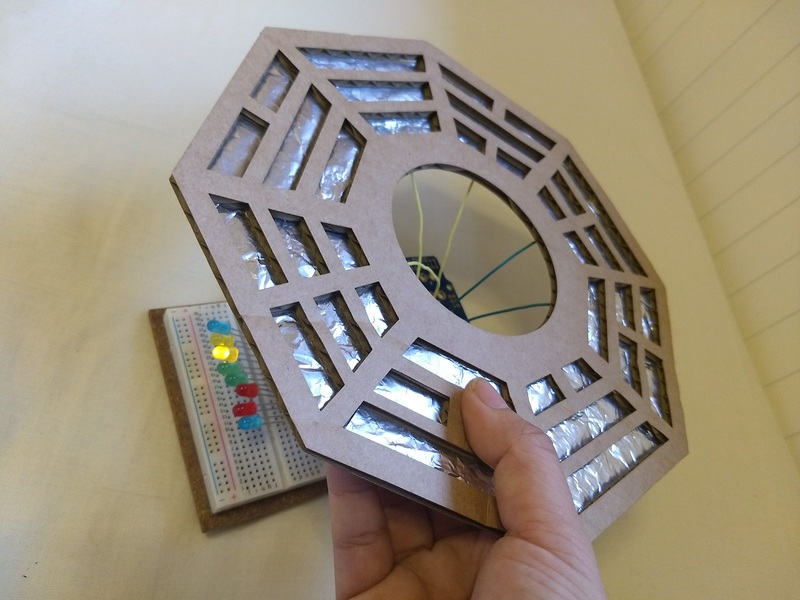 The two lit trigrams create a hexagram, from which a reading can be made using a wooden plaque accompanying the box. The plaque has been engraved with a series of drawings relating to nature. NB Coloured wires don’t connect with any wires they cross over. 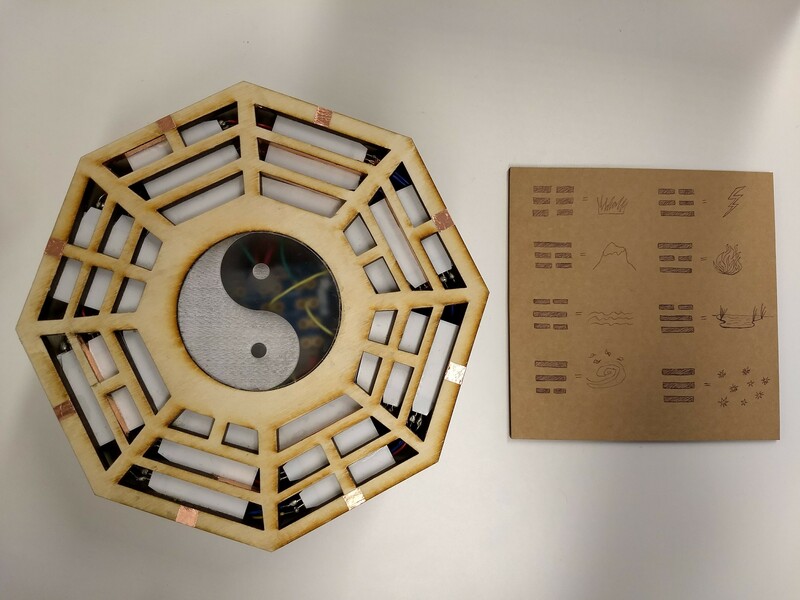 I laser cut a cardboard version of the octagonal box top which showed the 8 trigrams. 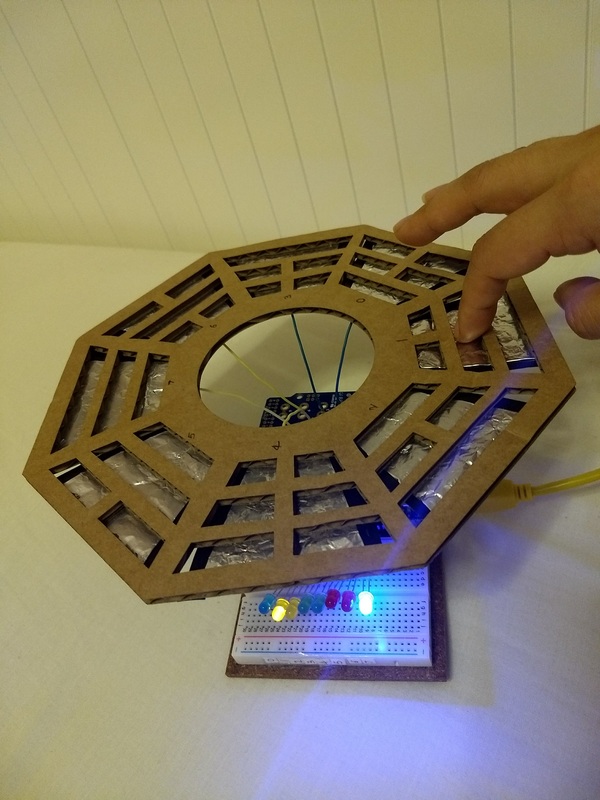 The first prototype had 8 aluminium foil capacitive touch sensors attached to the capacitive touch shield via wires soldered to its touch pads. Each corresponded to a particular trigram and was placed next to it on the cardboard prototype. On the breadboard I connected 8 LEDs to digital pins and to ground via a resistor. The capacitive touch shield was connected to 5V and ground, with its I2C bus SDA data connection attached to A4 and SCL connected to A5. First I made each LED light up when a particular foil capacitive sensor was touched. One LED was lit up per trigram sensor. The minimum viable product (MVP) also lit up a random LED when each foil sensor was touched. When testing the MVP I found that there was a lot of noise in the system. On touching the sensors some LEDs would flicker on and off whilst the trigram LED and random LED remained lit. 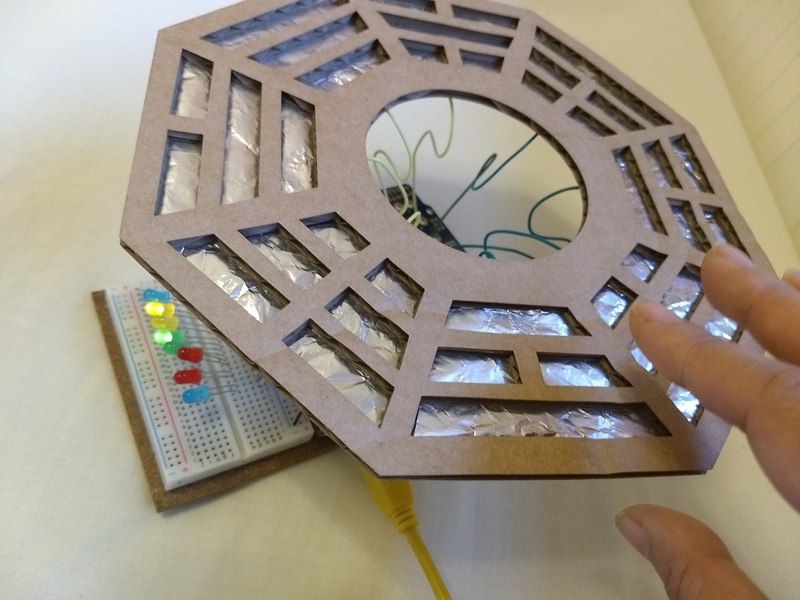 When more than one foil sensor was touched corresponding LEDs were all lit. 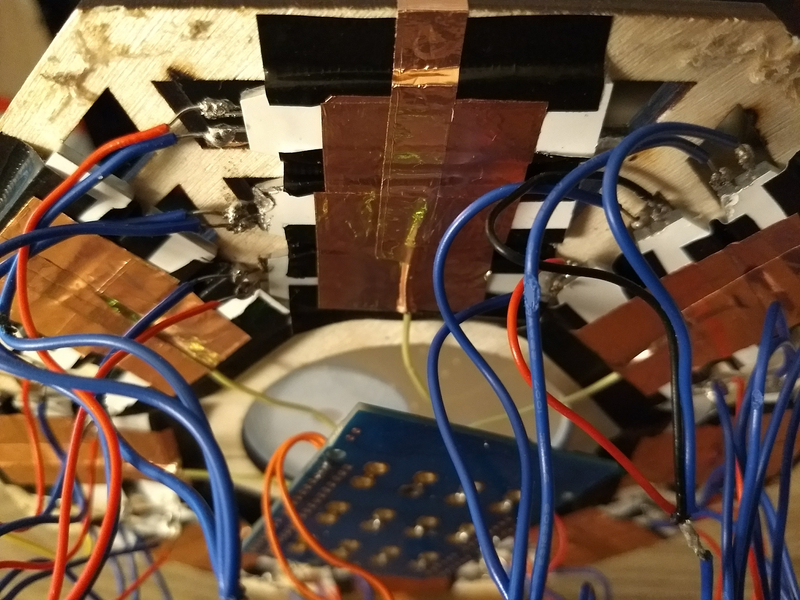 I tested the sensors for more accurate capacitive thresholds. I also introduced a delay to reduce chance of many LEDs lighting at once and excess flicker. However I first needed to decrease the size of the foil sensors to reduce the noise in the system. Reducing the size of the foil sensors helped with noise, but not enough, so I reduced them further using copper tape instead. Copper is more conductive than aluminium. 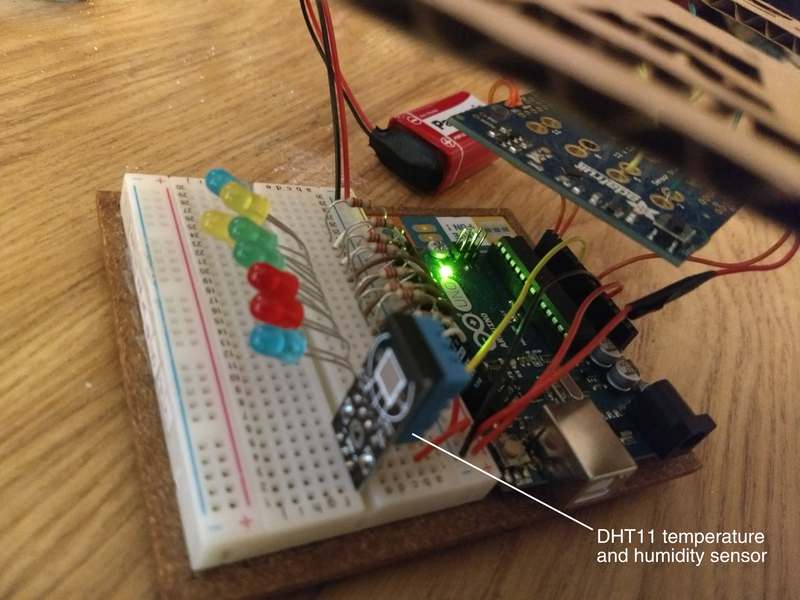 I introduced a temperature and humidity sensor to the circuit (DHT11) taking environmental readings at time of touch. The use of environmental readings in I Ching for Feng Shui is well documented. In the program I converted these readings to a random seed which was used to produce a random number corresponding to the second lit trigram. I also started using a 9V battery to power the Arduino (the 5V regulator on the Arduino board converts it to the voltage needed to power the circuit). To produce the wooden box I made an svg template and used the laser cutter to make the sides, top and bottom. I wanted the edges to be clean so I used a tenon saw and mitre box to produce the correct edge angles (67.5 degrees for an octagonal box). Initially I wanted to use LED strips. However I abandoned this idea as they used 12V and each strip (3 per trigram) required a transistor and a diode, taking up too much space on the breadboard. Instead I used white LED backlight modules which work the same way as normal LEDs with the advantage of producing even white light whilst using minimal space. For each trigram I soldered 3 backlit LEDs in parallel. I brought the copper sensors to the top of the box. I laser engraved a yin yang symbol in frosted transparent acrylic perspex for the top of the box. I also changed my initial idea of playing music on touching a trigram because on testing the wave shield I found it could not read SD cards. I changed the LED pins so that the wave shield could fit onto the Arduino pins and in the programme turned off the serial connection so that digital pin 1 (normally used in serial communication) could be used to control an LED. I drew an interpretation chart on cardboard which I later laser engraved onto wood. In terms of design style I kept the burnt laser cut edges, leaving out the perspex trigram windows I was going to use, giving a steam punk look with visible wiring. This setup can be used in performative readings or as installation. Technical and fabrication skills: soldering, laser cutting, laser engraving of acrylic perspex and wood, use of programming libraries (Wire, Capacitive touch shield, DHT). 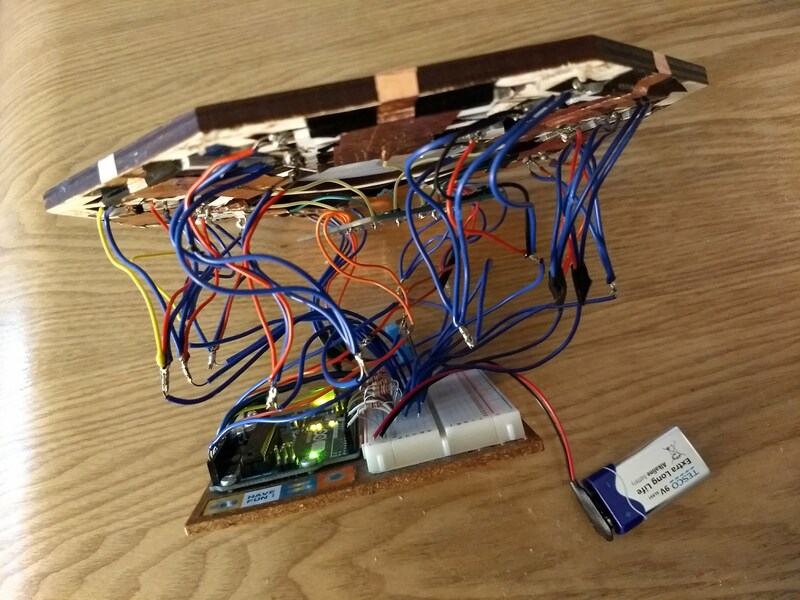 Inputs: DHT11 temperature and humidity sensor, 8 copper foil capacitive touch sensors. Outputs: 24 LED backlight modules. Instead of an interpretation chart I would like to implement a new wave shield and use nature sounds to represent the different trigrams. 1. Cage, J; (1961); “Silence: Lectures and Writings”.